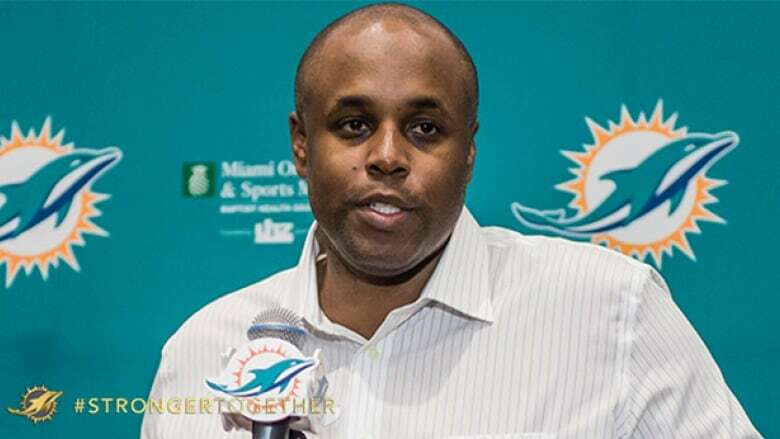 Chris Grier's hiring as general manager was finalized Monday, with the Miami Dolphins promoting their director of college scouting, and the brother of former NHL player Mike Grier, into the spot. Chris Grier has been in various scouting roles with the Miami Dolphins for the past 16 seasons. And each of the past 15 of those has ended the same way, without a postseason win. He's now part of the brain trust tasked to change that. Grier's hiring as general manager was finalized Monday, with the Dolphins promoting their director of college scouting into the spot. He replaces Dennis Hickey, whose two-year tenure with the team ended Saturday on the eve of Miami's finale to yet another dismal season. Grier was raved about Sunday after the Dolphins' finale by owner Stephen Ross and will report to Mike Tannenbaum, the team's executive vice president of football operations — who will oversee the team's search for a new coach. "I want to thank Stephen Ross and Mike Tannenbaum for this tremendous opportunity," Grier said. "I love this organization and feel I am the right man for this job. South Florida is very important to me and my family and I look forward to working with our personnel and coaching staff to add talent to the roster." The Dolphins planned an afternoon news conference to discuss the move. "I think very highly of Chris Grier," Ross said Sunday, following the team's 20-10 season-ending win over New England. It's one of the early steps in yet another off-season overhaul for the Dolphins. Interim coach Dan Campbell is a candidate to keep the job, though Chicago offensive coordinator Adam Gase is expected to be among the front-runners and reports surfaced Monday saying Mike Shanahan is scheduled to meet with the team this week. Plus, there's plenty of areas that need upgrading on the field. The Dolphins expected to contend in the AFC East this season, and finished in last place at 6-10. Players cleared out the locker room, packing their belongings in clear plastic bags and filling out the team's post0season surveys Monday morning. Some met with Campbell, and everyone had to turn in their playbooks and iPads before departing for another vacation that started earlier than they wanted. "I've been here four years and seen too many changes," wide receiver Rishard Matthews, who wants Campbell to return, said in a quiet locker room Monday. "As players, we've got to get it done." He's the brother of former NHL player Mike Grier and the son of longtime NFL executive Bobby Grier. When the Patriots let his father go in 2000, they also allowed Grier to pursue other opportunities — which led him to Miami. Grier has had interest from other GM-seeking clubs in the past, the New York Jets and Philadelphia Eagles among them. And he's not exactly inheriting an easy job in Miami. The Dolphins are one of only six teams who haven't won a playoff game in the past 15 seasons, a list that includes Kansas City and Cincinnati — two clubs that are in this year's postseason field and have a chance to end their droughts. Other than the Chiefs, Bengals and Dolphins, the other three teams who have gone without playoff wins in that span are Buffalo, Detroit and Cleveland. Miami hasn't even made the playoffs since 2008, which was three coaches and seven coordinators ago.